Thomas A. Counts, II focuses his practice on complex civil litigation, the defense of insurance claims, and coverage opinions. A respected litigator, Mr. Counts also practices Alternative Dispute Resolution. Mr. Counts was formerly managing attorney of the Nationwide Trial Division of Robey, Teumer, Drash, Kimbrell & Counts in Roanoke, and was an associate attorney at C.R. Jessee & Associates. Further, Mr. Counts served as a claim litigation counselor for State Farm Insurance Company in Alexandria, Virginia. Mr. Counts is admitted to practice law in the United States District Court for the Eastern and Western Districts of Virginia and to all Virginia courts. He earned his J.D. from the University of Richmond School of Law and his B.A. from Emory and Henry College. Mr. 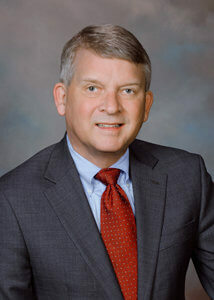 Counts is a member of the Roanoke Bar Association and of the Virginia Association of Defense Attorneys, where he served on its Board of Directors. Mr. Counts has lectured and written extensively on defense topics including soft tissue injury cases, uninsured and underinsured motorists, and direct and cross examination of medical experts. He was as a certified instructor for the National Institute of Trial Advocacy and was an adjunct professor of business law at both University of Virginia’s College at Wise and Virginia Highlands Community College. Prior to his law career, Mr. Counts was a Lieutenant Commander in the United States Naval Reserve. He was an administrative officer and an auxiliary engineering officer while on active duty, and held multiple officer positions as a drilling reservist. In his spare time, Mr. Counts follows collegiate sports, especially college football. He also enjoys reading both fiction and non-fiction books on history and military history.